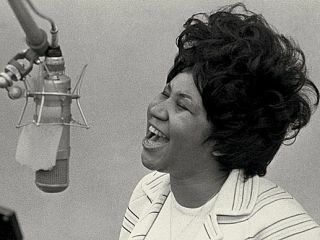 Aretha Franklin: a little respect is due. She's long been hailed as the Queen Of Soul, and now Aretha Franklin has been named as the greatest singer of the rock era. She saw off the challenge of Ray Charles to top a new poll that will be published in the December issue of Rolling Stone. Votes were cast by 179 musicians, producers and other music industry types. Soul singers feature heavily in the top 10 - Sam Cooke, Marvin Gaye, Otis Redding, Stevie Wonder and James Brown are all there. Elvis Presley is top of the rockers at number three, while John Lennon features at five and Bob Dylan at seven. Defining vocal greatness is difficult - do you judge purely on technique, or should attitude and ability to connect with an audience come into play? - but MusicRadar wouldn't dispute Aretha's presence at the top of the list.